Altitude range: Around 3650 metres above sea level. Field number FR 341 a. 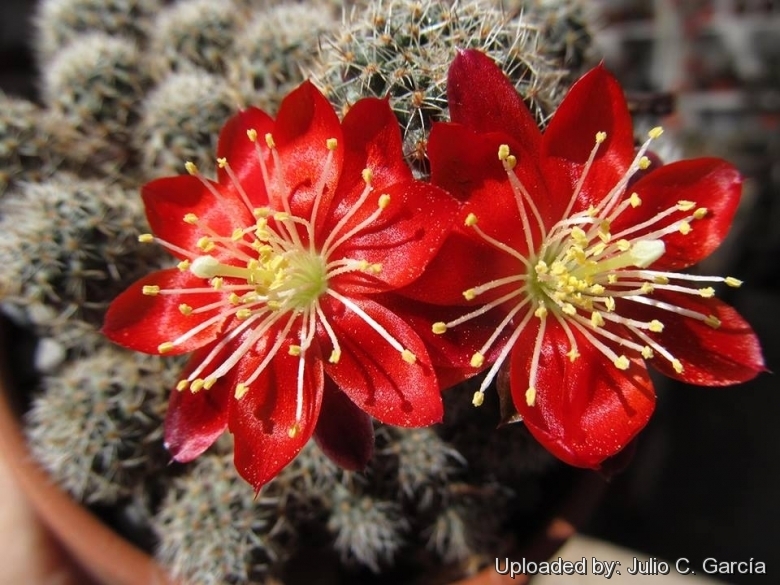 Description: Rebutia mamillosa v. australis is a small cactus species with prominent ribs, tiny bristly spines and vibrant red flower which is distinguished from var. mamillosa by larger body and flowers to 45 mm long with white filaments. It is one of the many geographical or morphological form of the widespread and variable Rebutia spegazziniana. Habit: It is a solitary or clustered stem succulent, branching at ground level to form low dense groups or mounds up to 15 cm wide. It grows quite close to the ground and offsets only with age. It would appear that in cultivation it grows larger and clusters more vigorously than in habitat. Stems: Individual heads 20-30 mm wide, globose to flattened globose (sometime short-cylindrical in cultivation). The colour of the epidermis is very dark greenish brown becoming deeply bronzed purple in full sunlight. Root: Taproot smaller than in var. mamillosa. Ribs: 10-15, forming prominent tubercles. Areoles: Small, brown, 1-1.5 mm. Spines: Short glass-white with darker tips, bristly, awl-shaped to needle-like. Radial spines: 12-20 all straight, 3-6mm long, white or yellowish. Central spines: 0-4, equal in length. Flowers: Diurnal, borne on the stems' side near ground level, 26-46 cm long and in diameter, bright red, with white filaments, 3-4 pale yellow stigma lobes. Similar species: Rebutia mamillosa (comprising v. australis Ritt. FR 1138 and v. orientalis Ritt. FR341a ) is similar to Rebutia fulviseta Rausch and Rebutia leucanthema Rausch. Both them have somewhat smaller flowers, smaller bodies, and generally rather longer, thinner spines than shown by Rebutia spegazziniana. All this species are individually isolated from each other yet they are morphologically very similar and difficult to distinguish when not in flower, especially R. mamillosa and R. leucanthema. Cultivation and Propagation: Rebutia mamillosa var. australis is easy to grow and recommended for beginners. Prefer gritty, porous mix with a pH slightly on the acidic side. Full sun to light shade, Water regularly in summer but do not overwater (the root system is rot prone) and allow the pot to dry out between waterings. Keep dry in winter Hardy to -4°C it will take low temperatures when dry and do require a winter rest period. This species will occupy a small flower pot comfortably and remain a manageable sized house plant.